This article gives you complete information about Zaheer Khan, Best fast bowler in Indian squad. This article gives information about profile and biography of Zaheer Khan. More details about Career performance of Zaheer Khan in Test, ODI, T20 and IPL cricket is also quoted in the article. 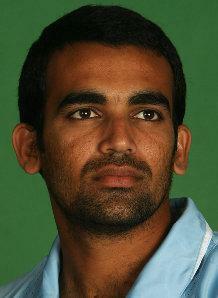 Zaheer Khan was born in the year 1978 October 7 at Shrirampur, Maharashtra, India. Zaheer Khan had taken 273 wickets in ODI cricket and 273 wickets in Test cricket. The best bowling performance of Zaheer in ODI cricket is 5 for 42 and 7 for 87 in test cricket. Zaheer khan is the leading fast bowler of current Indian team. Zaheer khan is one of the best fast bowlers of Indian team. Zaheer khan started his cricket coaching in 'National Cricket Academy' Bangalore. Zaheer khan made his one-day cricket debut against Kenya in the year 2000 in ICC Knock Out trophy 2000. Zaheer Khan is a experienced bowler of current Indian team where he started his bowling for India along with retired Javagal srinath. Zaheer Khan is also a player of Royal challengers bangalore IPL team. Zaheer Khan is a left arm fast bowler and a right-handed batsman. Zaheer Khan made his test debut in the year 2000 against Bangladesh. His IPL debut was against Kolkata Knight Riders in 2008 April 18 and T20 debut in December 1 2006 against South Africa. More details about the Career performance and profile of Zaheer Khan is given below. David ,you are one of the best writers on 'sports vale'I simply loved your compilation on Zaheer Khan .we very well know Zaheer is the best fast bowler INDIA has today but when it comes to recollecting his exploits on the cricket field we are left lurking for facts and figures. This article has updated our the records in the name of Zaheer .In spite of the injuries that have been dogging him he is still the best bet, I hope that he will return to the cricket field at the earliest.Your compilation shows that ZAHEER MADE BOTH HIS TEST AND ONE DAY DEBUT IN THE YEAR 2000 THAT MEANS HIS COMPLETED MORE THAN 10 YEARS OF INTERNATIONAL PLUS the number of earlier years spent in the making of a fast bowler .Research has proved that for a person to excel in any realm of life it takes a minimum of 10 years or 10000 hours of purposeful practice zaheer has put in that much ,that is why he is such a great fast bowler and that is the reason why India cannot lose him at his peak .Many bowlers can pick up the bowling skills exhibited by Zaheer Khan.